Herbaceous perennials are the mainstay of our garden and nursery. We mainly like to grow varieties that are self supporting and therefore easier to maintain, however, there are many that we also love that require some assistance in the stability department! Old favourites such as delphinium and monkshood - which we wouldn't want to be without - need firm support without being obtrusive, expensive and ugly! These are manufactured from industrial grade materials so are durable and strong. Rustic feel blends in very nicely with the surroundings. Attractive design means they can be left in place all year round. Multiple 10cm long studs around the base allow the plant support to be pushed into the soil providing a very firm and stable footing. Because of their hinged design, can be stored away flat, transported easily and reduce postage cost. 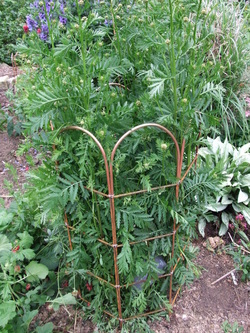 We can custom build to any size (height, length and width) to provide supports for any size of planting arrangement. Unique design - only available from Gardeners Cottage Plants. You wont see them anywhere else! 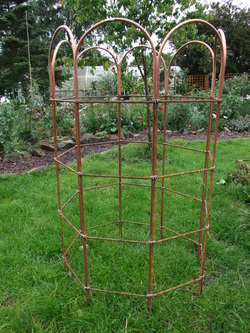 Prices start at £30 for a 3 tier hexagon support with copper hoop decor. Please contact us to discuss your requirements. A hexagon 3 tier support with copper hoop decor. Hexagon support proudly combining with campanula. Octaogon 4 tier support with copper hop decals. Unruly tansy is tamed with style. 3 tier octagon with copper hoop decals. Achillea is lightly embraced and enhanced by the support.